All the useful information that you need to know before sending money with OFX! One can only send the funds through a bank account as it does not take payments through debit and credit card. It also does not offer cash pick-up service which is a drawback for it. The company offers 24/7 customer support in various countries for immediate redressal of grievances, so one can contact it anytime. It also allows 24/7 trading facilities over the phone or online, which might make it the first ever currency trading firm to be open on weekends also. The company is highly secured so that one can transfer funds worry-free anywhere. So, on an overall basis, we rate it 7.5 out of 10. Pricing : How much does OFX cost? The company offers the best exchange rates in the market where one will get the rates with a margin as low as 0.4%. Once you agree with the exchange rate and start the transfer process, the rates get locked so you will know what exact amount will be received by the beneficiary. 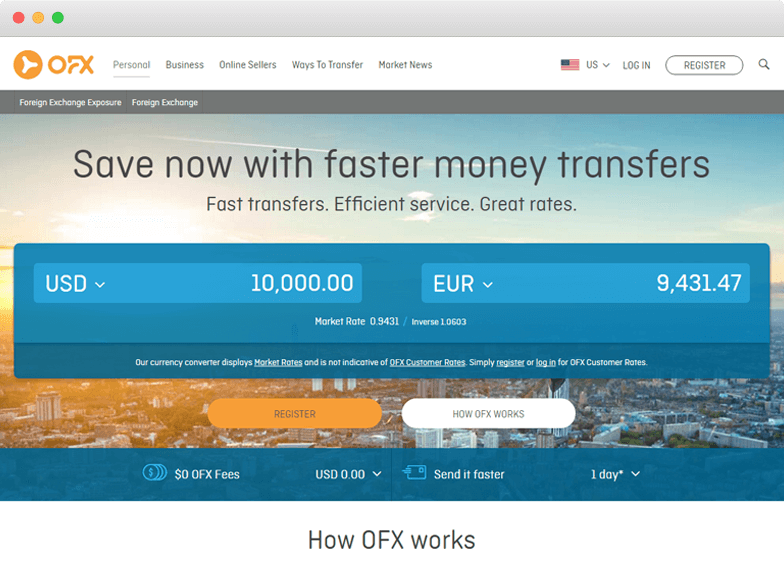 You can check the fee for transferring funds here at OFX Currency Converter. In most of the cases, intermediary banks do not charge any fee, but OFX won’t guarantee any deductions from intermediary or receiving bank when transferring your money to the beneficiary account. For example, JPY and ZAR attract additional fees due to local laws. This fee charged by the company is high compared to many of its competitors, and therefore, we rate it 7 out of 10 under the pricing head. Transparency: Does OFX have any hidden fees? The company does not charge any hidden fees from its customers. However, some third-party banks can charge fee in-between to complete the transaction so one must check with the bank before transferring funds. One can track the OFX transfers on their dashboard. The company also provides the details of transfer to users through SMS and email. So, for the transparency of OFX, we rate it 9 out of 10, as it is not providing direct tracking procedure for the user. Transfer Speed: How long does it take to send money through OFX? The company offers bank-to-bank transfers as well as online transfers. So they both differ from each other and take different time, according to the country and the currency you are sending. If you are sending money using Bank to Bank transfer services of OFX, then it will take 2-5 business days. In online transfers, it will take 1-2 business days, which is faster in both domestically and internationally. The company is not offering instant transfer services as many of its competitors. Therefore, we rate it 7 out of 10 for its transfer speed. Security : Is OFX Safe? It is a full member of the Australian Financial Markets Association and is regulated by the Australian Securities and Investments Commission. The company is registered as a Money Services Business at a federal level with the Financial Crimes Enforcement Network in the USA. In the UK, it is regulated by the Financial Conduct Authority as an Authorised Payment Institution. In New Zealand, it is registered as a financial service provider under the Financial Service Providers (Registration and Dispute Resolution) Act 2008. In Canada, it is a BBB accredited business and regulated by FINTRAC. All these accreditations and regulatory shows that the company is highly secured and offers safe services to its customers, henceforth, we rate it 10 out of 10 under the security head. You can have a look at the OFX transfer rate by using the apps without logging in, which is good for users who just want to know the exchange rates only. The company provides a unique link to refer any person through your account. If the person uses the services of OFX through that link and transfers the minimum amount than both of you will be rewarded for it. The company shares promo codes with its users through mobile notification, email and SMS. They can use this promo code for getting better exchange rates. So, keeping multiple factors in mind, the experts of Exchange Rate IQ have given it 8 out of 10 in user experience head. For using the services of OFX sign up here. Coverage: How many Countries & Currencies does OFX support? There are still many countries which are needed to be cover by the company to provide its services worldwide because many of its competitors are providing services to approximately 200 countries. Therefore, we rate it 7 out of 10 for its coverage and for using the services of OFX login here. I've been using OFX for years and they have always delivered the transfer promptly and as contracted. Easy to get hold of someone to speak to if necessary but has seldom been required. Usually when I have problems with my bank than anything to do with OFX. The biggest hassle I have ever had was getting identity documents to them, again my issue not theirs. The company asked too many personal questions and data in order to confirm a transaction. Transfer takes more than three days. I used OFX for the first time recently and can confirm the service was excellent and the exchange rate I received was significantly better than my previous Forex dealer. Great company and support. I am starting my third year working with them. Wow. From nerve racking to wow what a service. OFX has again proved that the company is not reliable and should not be trusted. I was a partner and OFX had the benefit of my hard work and at the expense it cost me to advertise to promote the company and bring clients. I have to date brought over 40 deals and have not received the commission agreed to be paid. My situation my be typical of the way the company works with partners. I have requested all the names of the clients that have open up an account through my efforts and again no response. The information included is from a head of sales at OFX. All customers and anyone reading this review should terminate any connection with this company. In the spirit of solidarity with a person that did no wrong and is being further persecuted by an arrogant selfish management of a money hungry company. Many reliable companies provide the same service don't stand by while this company exploits innocent people. Information I received is from the HEAD OF SALES OFX "Thank you for your email. We have set out the basis for termination of the referral partner program with you in previous correspondence. We confirm that payment has been made to your account with Bank Leumi le-Israel B.M for referral fees accrued prior to termination. As to today 4/172019 the funds have not arrived. I was never warned or notified of any infractions and no facts were presented. This kind of behavior is the same as accusing someone of a misdeed and not giving the person a chance to defend himself. Easy to use no minimum transfer, highly commended! Very good service. Website once logged in (my fault - had forgotten password) is easy to follow. Thereafter seamless experience being taken through the necessary steps, and kept updated at every stage. Good rate of exchange into Aussie dollars and arrived in recipient's account very promptly. Highly recommended. Very bad experience. They tell a lot of lies. In my case, first i was sent an email 1 week before that my payment has been credited to my account, now even after 1 week and 2 days, I still don't see the payment reflecting in my account. Now when the customer service was contacted, they say that their operations team is waiting for details from my bank. When I called my Bank Manager, she denied that anyone from OFX ever emailed or called up for verification process. OFX you guys are number one liars, and you are experts in keeping peoples money with yourself and even money-laundering and providing with false and fake emails to customers. Go back to your GARAGE days, because that is where you belong. I would never ever recommend you to anyone and if anyone is reading this review, don't do business with these liars and imposters. I forgot to put in the reference when making payment. But got great support by phone and email. That's what you need when something goes wrong. Great service. Thank you! I've just used OFX to transfer substantial funds from a UK house sale to the USA. Any trepidation I had about using OFX was quickly allayed by their extremely competent and very efficient customer service. David Coombs guided me every step of the way (including over 12 emails in three days) to reassure me and explain the process. It is the best financial customer service I have ever received and as a retired stock trader that is saying something. The transfer was fast, transparent and saved me over $7000 in exchange fees over HSBC. Very happy with the service OFX is providing. Very professional & I would definitely recommend OFX to anyone. Especially in comparison to the very poor service from the French banks - OFX is the best! Hands down the best FX and Wire Transfer Company Around! After using 2 other Wire transfer and FX companies, OFX has by far been the most reliable and also most competitive on rates. To add to their great service their app is even better. I am able to initiate all the wires directly to our vendors whilst I'm on the go. The only drawback that requires planning is that your first wire is subject to a 4 biz day hold. But if you plan accordingly its a small pain to incur. by Kunal Arora - The London Bespoke Club Inc.
OFX has been my company of choice for transferring my pension from UK to US since 2016, they have never failed to perform to extremely efficient standards. I thank them. Most pleased with service. Easy enrollment, friendly knowledgeable customer service. Go to the OFX website. Click on “Get Started” at the mid of home page. You will be on a new page. Here select the type of account you want to set up, i.e., Personal Account, Sole Trader account or Business Account. Enter all the personal or business details as asked by the company. Enter the banking details and verify your identity. You will get a confirmation email. Click on it. Submit it and enter the amount you want to send through OFX website. Recheck all the details and confirm the transfer.